BusinessWeek.com interviewed me about new product marketing several years ago. Because I also own NewProductMarketing.com, I regularly get emails and calls from new product developers looking for help marketing their new products. A wide variety of new inventions have made their way across my desk. Some are still just an idea in their inventor’s mind while others have seen the light of day in the form of models and even working prototypes. Eventually only a small percentage of these new inventors and their inventions commit to actually putting their money where their mouth is beyond tying up any potential intellectual property rights they may or may not be entitled to – a subject by the way – which could populate an entirely different blog. When an “inventor” has reached this level of commitment i.e., manufactures a minimum production run of their product either locally or in China, they predictably then produce two new problems. The good problem is that their product is an instant success and they can’t build enough of them to satisfy demand. I don’t ever get calls from these types of inventors! Even after nearly twenty years consulting, I am not so sure they exist. Instead, I get calls from inventors with the “bad problem”, a problem which falls somewhere on the following continuum. Mr. Inventor has just sunk his lifesavings or mortgaged his house to pay a manufacturer to build the first production run of his new product. Mr. Inventor calls me because he realizes he needs to sell the 5,000 new widgets he just bought and paid for and he needs to sell them fast! It is here where Mr. Inventor comes to grips with the fact that his belief in his invention does not necessarily translate into the market’s belief in the commercial viability or value of his invention. For inventions that have reached this enviable position, I have again determined they fall into two categories. Inherent in both is a degree of obviousness although not the obviousness germane to patent law. Mr. Inventor’s invention is either “obviously useless” or it is “obviously useful.” Both of which are determined in the commercial marketplace. Granted, obviously useless products are available for sale but more often than not it is a product’s obvious usefulness that sustains its presence in a marketplace. Discerning which products will be commercial successes from those that won’t ought to be a science. 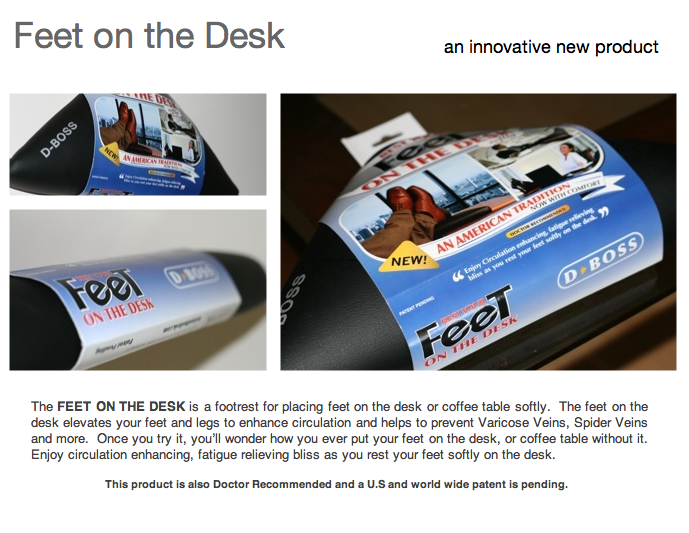 Consider the new product called “Feet on the Desk” which crossed my desk today. Gary the inventor called me today to ask for help selling all the units he just had delivered from China. I don’t know which of the above “obvious” categories his product fits in but I told him he should call the “Relax The Back” chain. He hadn’t ever heard of the company. Whether he makes the call or not is up to him. It will be interesting to learn if in a year from now Gary’s new product is on store shelves or if it has ended up like thousands of other new products – shelved and gathering dust in its inventor’s garage. In the end, only buyers in the market or the absence thereof will ultimately tell us whether this new product – Feet on the Desk – was Obviously Useless or Obviously Useful. “The FEET ON THE DESK is a footrest for placing feet on the desk or coffee table softly. The feet on the desk elevates your feet and legs to enhance circulation and helps to prevent Varicose Veins, Spider Veins and more. Once you try it, you’ll wonder how you ever put your feet on the desk, or coffee table without it. Enjoy circulation enhancing, fatigue relieving bliss as you rest your feet softly on the desk. This entry was posted on February 20, 2008 at 6:34 pm and is filed under New Product Marketing, Product Developers, Relax The Back. You can follow any responses to this entry through the RSS 2.0 feed. You can leave a response, or trackback from your own site.